In the dead of winter, your boiler is perhaps the most important appliance you own. It keeps your home warm and comfortable through the freezing Indiana weather. But it can also be dangerous, if you're not careful. Here are five boiler safety tips, to make sure yours runs smoothly and safely all season long. 1. Keep the area clear. Some people use the area around their boiler as storage for things like holiday decorations and old clothes. But the heat generated by the unit makes this a bad idea. Anything flammable, like paper or cloth, or subject to melting, like plastic, should be kept at least three feet away from the boiler. Keep children from playing near the unit as well. There's another hazard to keeping boxes and other items in storage near your boiler. Obstructions around it, or around any of your vents, can overwork the system, wasting energy and wearing it out prematurely. Make sure all vents and registers are kept clear, so air can flow freely. 3. Check your exhaust vent. If your boiler's exhaust can't be safely vented outside, carbon monoxide gas will build up in your home, causing serious illness and even death. Make sure your exhaust vent is properly sized for your system, and clean it regularly to be sure it doesn't become obstructed. 4. Install smoke alarms and CO detectors. 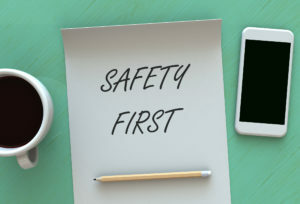 If there is a boiler safety issue, you'll want to know about it immediately. A smoke alarm lets you know if something is burning, and a CO detector tells you if there's a gas leak. Test both of them regularly, and replace the batteries at least once a year. 5. Get an annual inspection. Your HVAC technician should give your boiler a thorough inspection every year, to make sure it's running properly, repair or replace any failing components, and keep it operating at optimal efficiency. If there are any safety hazards, the technician can spot them and address them before they turn into problems. To learn more about boiler safety, contact us at Hartman Brothers. We're New Haven's trusted source for quality HVAC solutions.